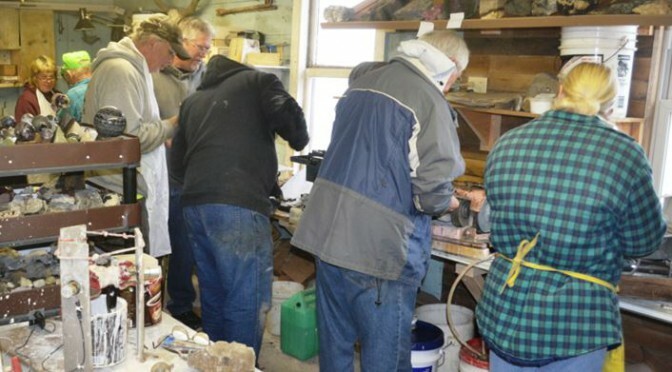 If you have yet to visit the Wayne County Gem and Mineral Club workshop in Wolcott during one of the club’s monthly Saturday events, then you are missing out on the opportunity your club membership provides you to saw, slab, grind, and polish rocks into cabochons, spheres, or whatever geometric (or non-geometric) design you wish. Not to mention the camaraderie provided when 10-15 or more rock hounds come together to partake in such activity. But there is even more you are missing. Each month we convene it seems that our Workshop Coordinator, Glenn Weiler, has managed to introduce something new and creative to the shop. Last spring and into the fall his focus was on sphere machines, first a small one with products that, well, to be honest probably did not measure up to the technical definition of spheres (translation, they were oblong). But, Glenn fixed all that with a little tinkering, and upon our return he was creating spheres to the eye that also stood up to the test of the caliper to the millimeter. Two inch perfect spheres of green jade, blue sodalite, and red hematite-laced agate models of Earth or Mars now accompanied the polished pyramids of previous years. But that was not sufficient and when we appeared in November the shop featured an Erector-set appearing machine capable of producing Jupiter-sized spheres. He is still working on a Saturn machine complete with rings. OK, well maybe not, but I would not be surprised. The early sphere machines required continued user interaction. The spheres had to be brushed with grit-laden water periodically or they would dry out between the polishing pads. Glenn solved that late last year by simply placing a chain on a pully aside the motor that drove the polishing cups. This chain ran from the water up to the polishing pads and back down, effectively and continuously transporting polishing fluid to the sphere. This automated lubricating process allows the user to work on another project while the sphere was being polished. 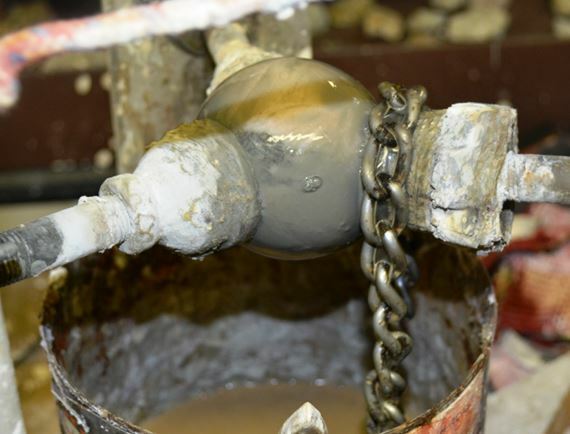 Below: chain pulls grit and mud up to sphere. 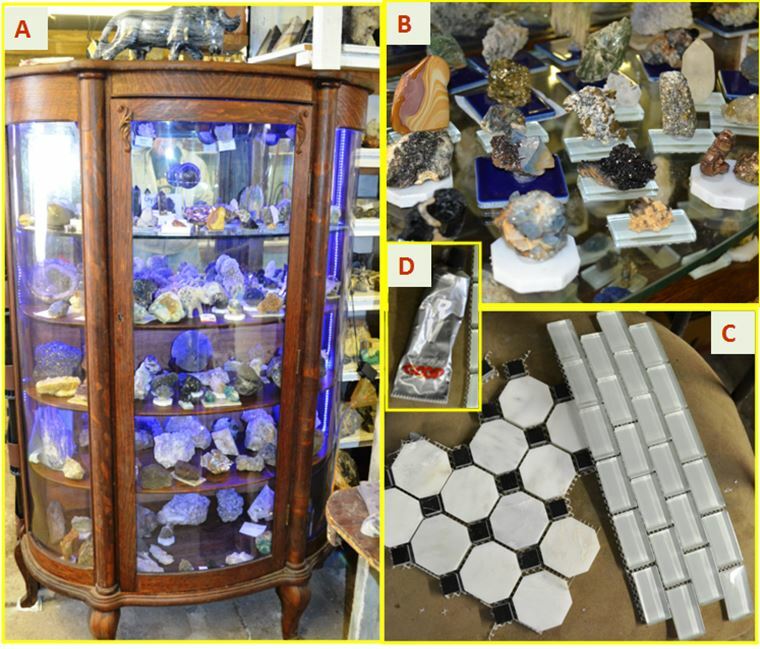 With sphere making conquered and three operating machines in the workshop, Glenn turned his imagination to another aspect of lapidary/mineral collecting: how to display the creations. He had purchased a “new” antique glass fronted display case at a yard sale and considered how to populate it. After inserting LED chain lights (opting for blue) it was time to mount the specimens. We all know we can buy very nice inch or two inch plexiglass squares sold expressly for mineral display and use mounting clay to orient pieces as desired. But that is not very creative and Glenn had a novel idea. He visited the small tile aisle of a big box home improvement store and picked out a few sheets of mosaic tiles. Hexagonal, rectangular and square shapes are available. They come in clear acrylic, white porcelain and in just about any color you might prefer. You can acquire about 100 of the smaller tiles in a square foot and do so for around $10. 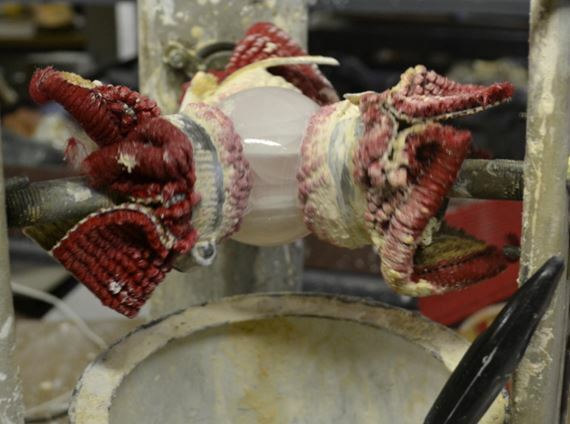 Sure mounting clay works, but if you can hold a sneaker together with “shoe-goo” it ought to work on minerals also. It does. And that was not enough “new stuff” for the club in April. No we purchased a hand held polisher and everyone got a crack at polishing slabs. 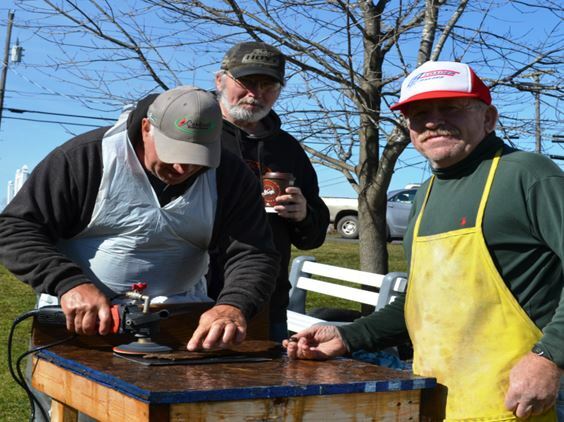 Glenn works on a large agate slab while Gary works on his Tim Horton’s coffee and Bill pretends he is a workshop model. We occasionally even take our tools and our skills on the road. 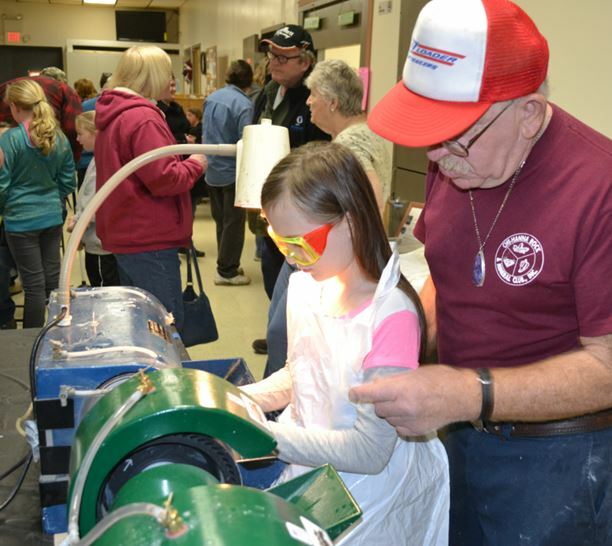 In March, Bill helped some 70-90 kids learn how to polish a stone at the Che-Hanna Show in Sayre, PA.